Buying a home can be very exciting, but for many people it can also be very risky and end up costing a lot of time and money if they are inexperienced. In particular, these problems manifest themselves most often when buyers "go it alone" and walk a mine field of legal and procedural requirements as "for sale by owners", or encounter unscrupulous parties on the other end of a transaction. Only AFTER, do they find out and learn what they should have done in the first place. Like any major life event, this is when it is wisest to use a licensed professional! Only a REALTOR® is going to have the experience and expertise, to not only find your dream home efficiently, but to protect you as a buyer against the many potential disasters that may exist on the other end of a deal. Contact us for a consultation about your goals and how our services can help you. Find homes for sale, or foreclosures or view our South Tampa featured listings. 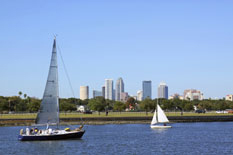 Our MLS search gives you the ability to search ALL homes in the greater Tampa Bay area. Your real estate investment is often the most significant financial decision you will make in your lifetime. I encourage you to contact us to discuss the services we provide in order to make that transaction as smooth and risk-free as possible.